The common denominator on this disc is the unseen Brahms; not that we have four cello concertos sounding like the music of a composer who wrote none - the double concerto notwithstanding - far from it. Each of them is fairly distinguishable from the other. Neither does the best known of them, the Schumann, overshadow the others because of his or its reputation. On the contrary, even if his concerto was held as a model, it also remains the most problematic and unsatisfying of them all. It took him the best part of four years before he had completed his revisions and then he did not live to hear the first performance which took place another four years after his death. Volkmann’s concerto, like Schumann’s unified into a single movement and sharing the same A minor key, is a highly attractive work, and like his third Serenade and First Symphony, enjoyed much popularity during his life. Richter lent his imprimatur to Volkmann’s music by performing it in Vienna and London. The Cello Concerto was played at St James’s Hall on 31 May 1880 by Bürger, and the Yorkshire Post critic Herbert Thompson timed it in his diary at 20’ rather than the 14½’ we have here; perhaps it was slow tempi which prompted the critic of the Athanaeum to dismiss it as ‘unsympathetic and not likely to endure’. 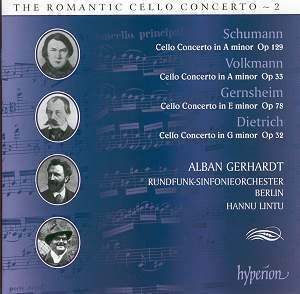 Two of the works had particular soloists in mind, Karl Schlesinger (Volkmann), and Friedrich Grützmacher (Dietrich), while Schumann may have intended his for Christian Reimers, principal cellist of the Düsseldorf orchestra, though Ludwig Ebert actually premiered it in 1860. Gernsheim’s is also in a single movement, so one wonders if these three composers may have felt that the instrument lends itself to such a concise and compact structure. The music throughout is glorious, the Dietrich concerto (its cadenza by Grützmacher) is a revelation, although after its first performance it remained unpublished and has an unknown performance history. Gernsheim’s is the ‘youngest’ by half a century of the four, and though written a decade after his friend Brahms’s death, maintains a link in many places by dint of its muscularity and orchestral textures, even similar thematic outlines in places. All the works show the considerable demands made upon the soloists of the day. Casals espoused the Schumann concerto and probably single-handedly ensured it a permanent place in the repertory; would that he had done the same with the other three. The virtuosic Alban Gerhardt certainly gets around the notes on this excellent Hyperion recording - another triumph for Andrew Keener and Simon Eadon who use the Berlin church’s generous acoustic to splendid effect. Despite an occasional blandness in colour, he is passionate when passion is called for, while at its most lyrical he responds with warmth and tenderness. His instrument is an 18th century Gofriller, a maker whose cellos are much sought after. Casals played one for sixty years, other owners include Piatti, Feuermann, Lalo, Rose, Starker and du Pré. Gerhardt has done a splendid job in making a case for this music, as has Hannu Lintu at the head of the excellent Berlin Radio Orchestra. One suspects, however, that the two hitherto unknown concertos may not make it beyond CD collections and radio stations to concert platforms. One can but hope to be proved wrong.